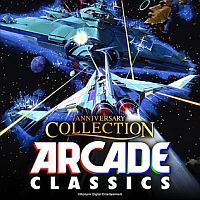 Konami 50th Anniversary Collection - Arcade Classics is a compilation of eight games created by Konami, which debuted on arcade machines in the 1980s and 1990s. The set was released on the occasion of the fiftieth anniversary of the creation of the Japanese company. The compilation of Konami 50th Anniversary Collection - Arcade Classics includes the following items: Haunted Castle, Typhoon (A-JAX), Nemesis (Gradius), Vulcan Venture (Gradius II), Life Force (Salamander), Thunder Cross, Scramble (which also had an Xbox 360 remake in 2006), and TwinBee (this production also received a refreshed version created for the Nintendo 3DS). Almost all of the games that make up the 50th Anniversary Collection - Arcade Classics are shoot'em ups, in which we sit at the helm of flying combat machines, eliminating hostile enemies. The only exception is Haunted Castle, where we play the role of Simon Belmont, and wander through the titular castle which belongs to Count Dracula. Each game in the Konami 50th Anniversary Collection - Arcade Classics is playable on its own; selected titles also allow you to play in the company of a second player in a local co-op mode. Although the graphics design of the items contained in Konami 50th Anniversary Collection - Arcade Classics remained untouched when compared to their archetypes, the developers have enhanced these productions with some modern solutions. In addition to the games themselves, the set includes an ebook filled with information about each of these titles, interviews with developers, curiosities from behind the scenes and conceptual materials.